This is far from an authentic carbonara, but one bite will transport you to Rome nonetheless. And with healthy spiralized kohlrabi in place of the traditional spaghetti, you can feel a little less guilty about all the bacon. You can of course substitute cooked spaghetti for the kohlrabi for a more traditional take on carbonara. Per Serving: 503 calories; 33g fat; 16.4g carbohydrates; 36g protein; 136mg cholesterol; 1599mg sodium. 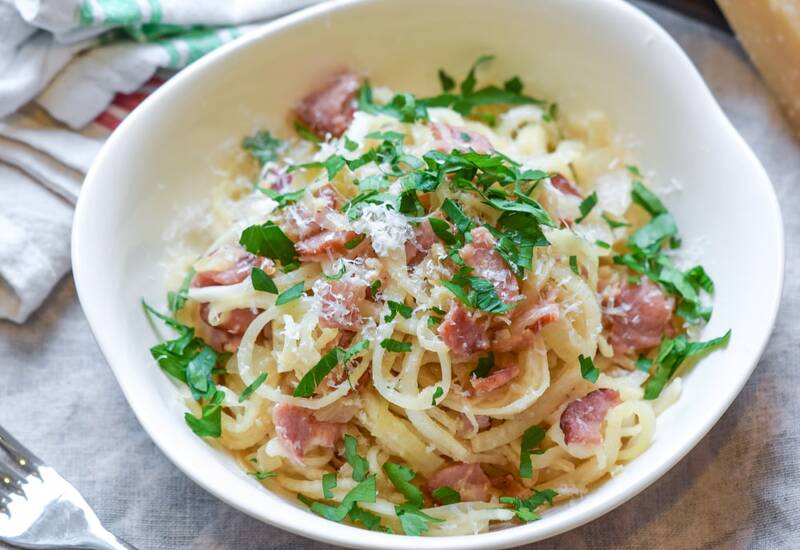 I've just become a fan of carbonara, after realizing how EASY it truly is to do at home. I didn't have kohlrabi, so just used spaghetti. Another change - I needed to use up some prosciutto (instead of bacon), which was tasty, and kept the fat content down compared to bacon. When adding the egg, I found it's quite hard not to scramble it and have to practice much patience with low heat - but this definitely pays off! Also keeping some pasta water to add with the egg helps add creaminess. Simple! Elegant. I found kohlrabi at the Farmer's Market so decided to try this recipe. A hearty plant for a hearty dish! The use of bacon for the carbonara was delicious. Cooking the kohlrabi in the bacon grease made everything so flavorful. I definitely recommend this recipe, it's so easy, you can't go wrong. You had me at (turkey) bacon. Such a good recipe! Spiralizing the kohlrabi was a great idea. I've only ever had kohlrabi slaw, so this was a nice surprise. Couldn't find kohlrabi, but spaghetti noodles worked fine. You can't really go wrong with bacon and pasta. This is great for date nights, dinner parties, and the like. Love the spin on carbonara. Kohlrabi tastes great and is a lighter, low carb alternative. I added lots of grated cheese on top and salty bacon.